But sometimes you would like to simply have that chocolate covered bacon topped with more chocolate and more bacon that is all on top of a sundae (Okay, maybe not that exactly), but you may have to run that extra mile, several days in a row, to keep those calories from trailing behind you. That is probably the hardest part of it all. Although, every now and again a sundae topped with bacon (if that is your choice) is totally okay with it. Blanch your asparagus by boil water. Place cut asparagus into the boil water and let it boil for 3-4 minutes. Quickly drain and place into an ice bath to stop the cooking process. Let the asparagus cool completely (about 30 minutes). 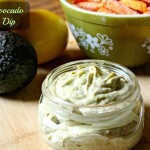 Drain well and place into a mixing bowl. Add in your chopped tomatoes, olives and avocados. Mix together your Italian dressing mix with the olive oil and apple cider vinegar and pour over top of your asparagus mix. Serve! 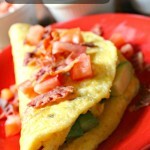 *You can also use a cup of bottle Italian Dressing as well. 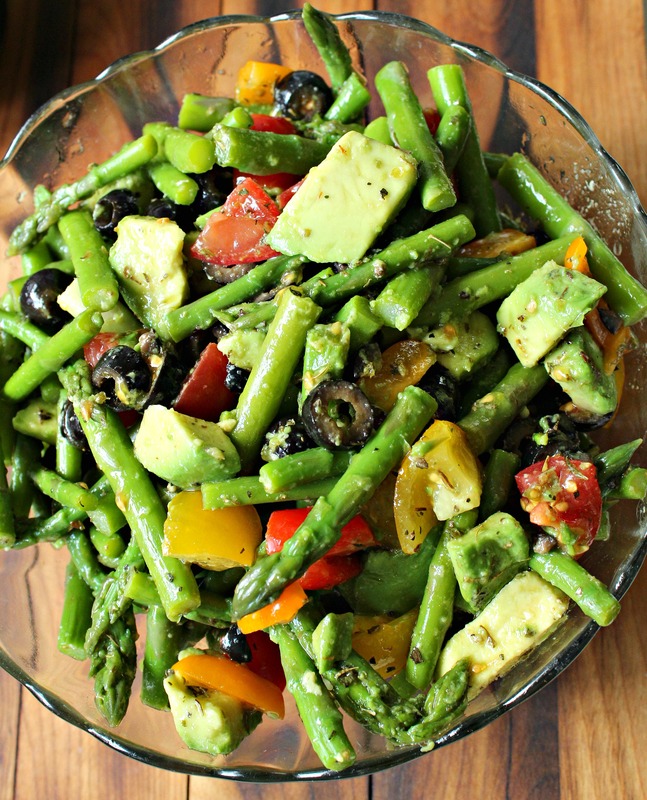 Such an easy salad the asparagus and avocado salad is always a big hit at church picnics, family get togethers, parties, pot lucks or even at home because you want to be able to scarf down the whole thing in private with little repercussions (I totally get it). 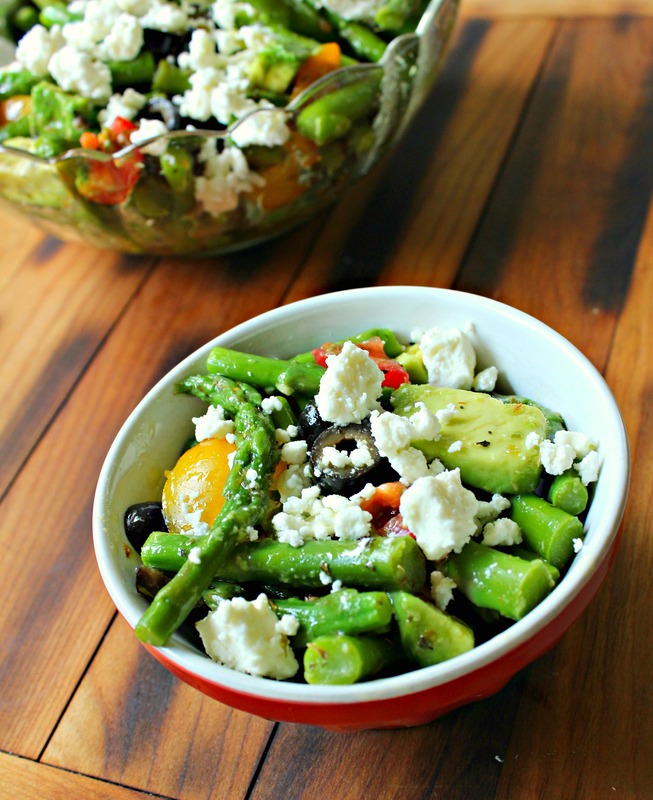 You can so totally do that with this salad and be okay. 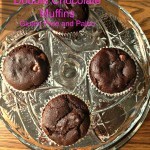 I usually half the recipe though so I don’t become a binge eater of it but I could so do this! It definitely beats getting into bed with a tub of ice cream! 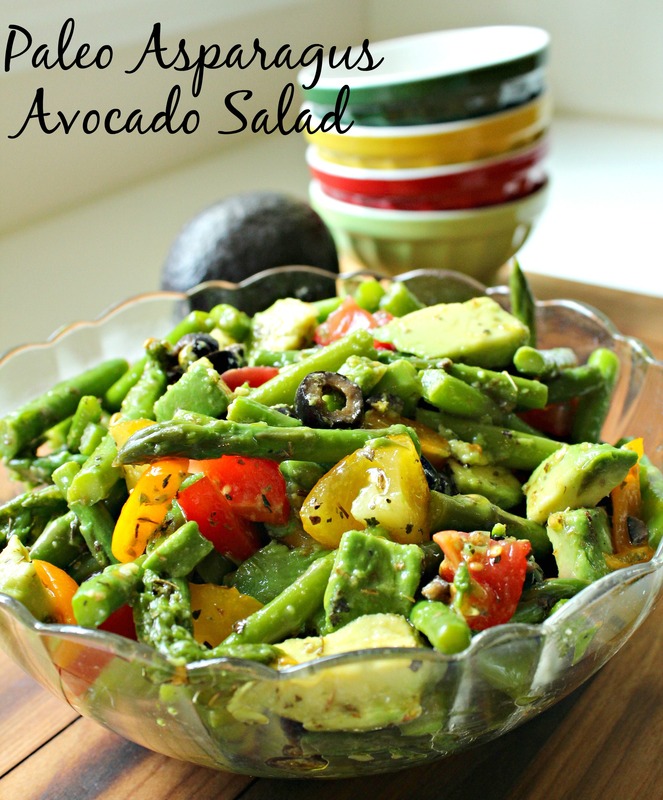 The Asparagus and avocado salad is also great with your favorite dressing vinaigrette too! Just use a cup to coat all of those amazing veggies well too. I have used a simple fig balsamic vinegar, a little salt and pepper and some granulated garlic as well and it makes the perfect pairing for any dinner (especially steak). What is your guilty pleasure when it comes to food? Mine honestly would have to be brownies! Just about any kind with a little ice cream and hot fudge on top! YES! Perfect for me!